The quest for the NCAA championship begins this weekend at the Stagg Field tennis courts. Chicago, the nation’s second seed and the top seed in their region, will have a bye in the first round and will play the winner of the No. 30 Carleton/Grinnell match at 2 p.m. on Saturday. Being the favorite, the Maroons are likely to advance to the regional final and will likely play their archrival No. 11 Wash U Bears on Sunday at noon. While the Maroons boast three fourth-years that have received fourth place in the NCAA DIII tournament for the past three years—Kendra Higgins, Jennifer Kung, and Carmen VacaGuzman—there is not a lot of tension and nerves to take home the national title. Luckily for the Maroons, they will avoid Emory, the team that has beaten them in two of the last three national semifinals but that the Maroons beat in this year’s UAA title match, until the final round. Still, Chicago’s draw features national powerhouses No. 3 Amherst, No. 6 Carnegie Mellon and No. 8 DePauw, a team that the Maroons split duals with this season. But the Maroons will not visit any of those teams until the semifinal. For now, the Maroons are concentrated on besting their regional opponents. Carleton defeated Grinnell on April 1, 9–0. If Chicago plays Carleton on Saturday, they should be ready for an easy victory. The two teams faced off on March 21 with the Maroons cruising to a 9–0 win. But there were a couple of roadblocks along the way to victory. Being a non-conference match, and with the Maroons already having clinched the dual, a 10-point tiebreak was played in place of a third set for Kung and VacaGuzman at No. 2 and 3 singles, respectively. 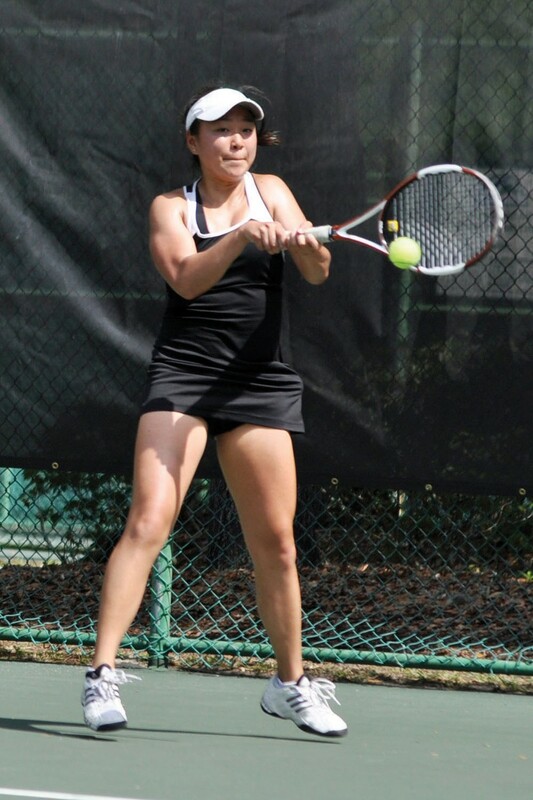 Kung won her tiebreak 12–10 while VacaGuzman won 10–7. “I don’t want to underestimate any team; we will treat each team like a Williams or Amherst,” first-year Kelsey McGillis said. The Maroons will have another familiar opponent in Wash U if the Bears advance to Sunday’s regional final. Chicago beat Wash U 8–1 on April 15 at home. With such a large rivalry and stage, the Maroons are going to implement what they learned from their last match against the Bears. With a Chicago starting lineup that includes two first-years, McGillis and Megan Tang, the Maroons need to adjust mentally to the new environment of the NCAA tournament. The combination of players, from first-years through fourth-years will be key in determining the Maroons’ success. Chicago opens play at 2 p.m. on Saturday.